Just watching TV without also using a tablet or smartphone at the same time seems to be on its way out. Earlier this month, Nielsen launched the first part of its report on primetime TV viewers in the U.S. and today, the analytics company is taking a deeper dive into the demographics of those who simultaneously watch TV and use their tablets. 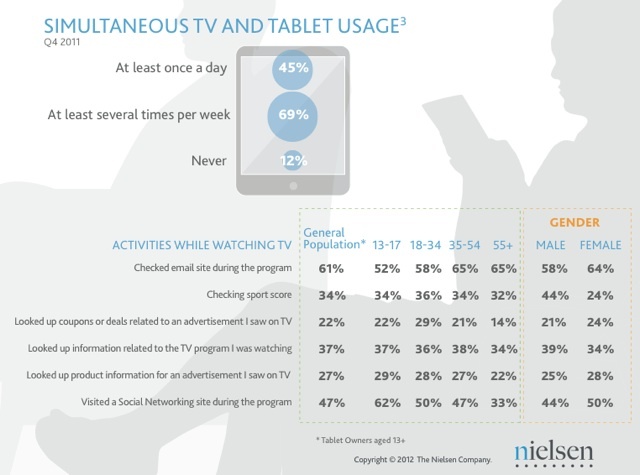 According to Nielsen, 45% of tablet owners watch TV and use their tablet together at least once a day. A whopping 69% say they do so at least several times a week and only 12% say they never do this. There are some interesting differences between how men and women use their tablets in front of their TV. Women, says Nielsen, are more likely to look up information related to an ad they see on TV than men, while men are more likely to look up general information related to a TV program they are watching than women. Men, on average, are also far more likely to check sport scores on their tablets than women (44% vs. 24%). Unsurprisingly, younger tablet users are more likely to use their tablet in form of the TV than older ones. The only activity where older users tend to use their tablets more is checking email. Overall, checking email is also the most popular activity for tablet owners while watching TV (61%), followed by visiting social networking sites (47%) and looking up information about TV programs. Females spend 61.2% of their timeshifted viewing during primetime watching Dramas. Online adults aged 25-54 are 23% more likely than the average U.S. Internet user to follow a brand via social networking and 29% more likely to purchase a product online that was featured on TV.